I have severe depression and general anxiety disorder. These things are important to know only because together they often cause me to make sporadic and rash decisions without taking the full picture into consideration first: a sort of tunnel vision. This is often the case with some, or most, of my biggest life decisions. 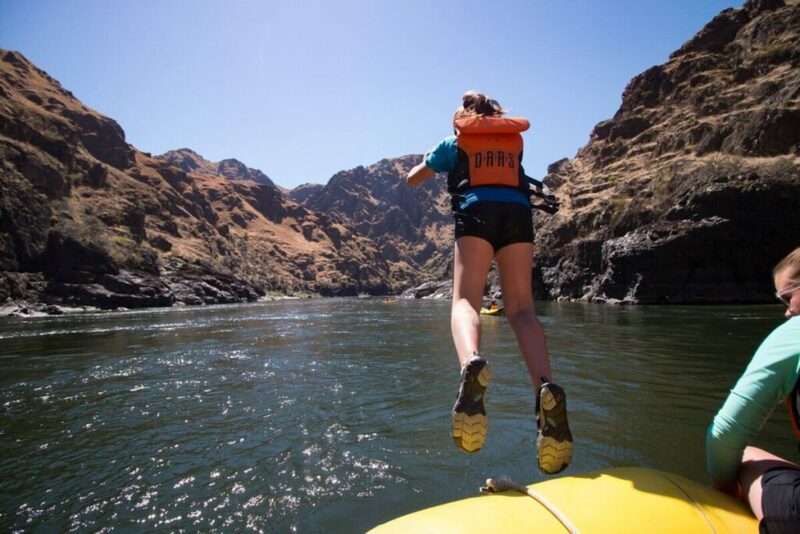 It was because of this sort of tunnel vision decision making that at the end of a long winter in Minneapolis— wanting to be anywhere but there—I found myself quitting my job to go to Washington State and become a whitewater rafting guide. I did this regardless of the fact that I had never stepped foot in a raft in my life and had no river experience to speak of. Luckily, it turned out to be the best decision I had ever made in my life. I seem to survive on luck. At the end of my first rafting season, I decided to celebrate by once again doing something I had never done before. I had a month before I could raft again as I had to wait for the dam on the river Tieton to be released. So, I decided to walk a distance of one hundred and eighty miles to kill some time. 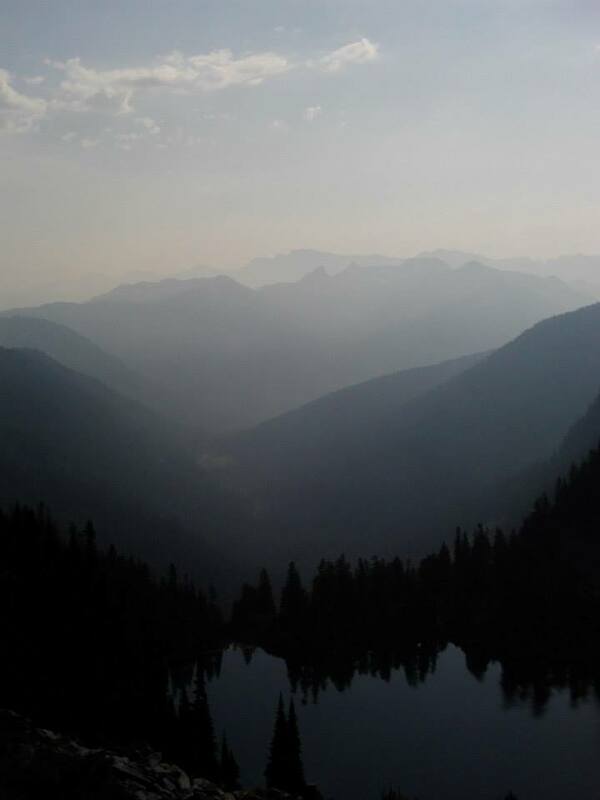 I had never done a solo hike in the wilderness, and the Pacific Crest Trail (PCT) ran the distance between the Wenatchee River in Leavenworth and the Tieton River down by Yakima. 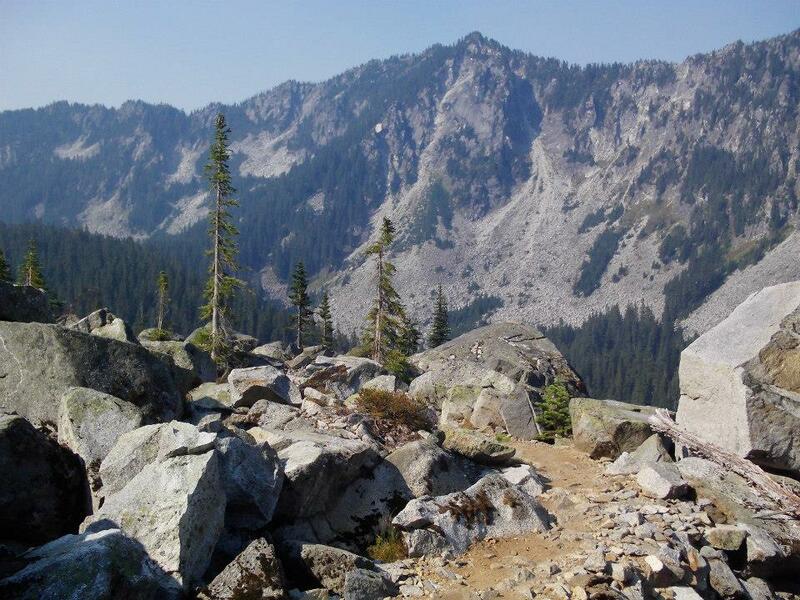 There are two sections, the first being a seventy-mile stretch called section J, which is one of the most populated sections of the PCT due to its beauty and proximity to Seattle. The plan was to rest at the end of that section— at Snoqualmie Pass— for a couple days before continuing on to complete Section I, a one hundred and ten-mile section to White’s Pass, before finally hitchhiking down to the river in a tiny town called Natchez. Although I had never done any secluded long-distance hiking, I had a lot of experience living out of a backpack and traveling long distance on foot, so I figured it would be easy. After ordering some gear online including a Lifestraw for filtering water and a cook set, I went to Stan’s Merry Mart (a weird half Ace Hardware, half outdoors and hunting gear store in Wenatchee) to get the rest of my equiptment. I bought a small inexpensive one person tent for my dog Bubba and I to share, a buck knife, some cheap hiking boots, a headlamp and some bear mace. 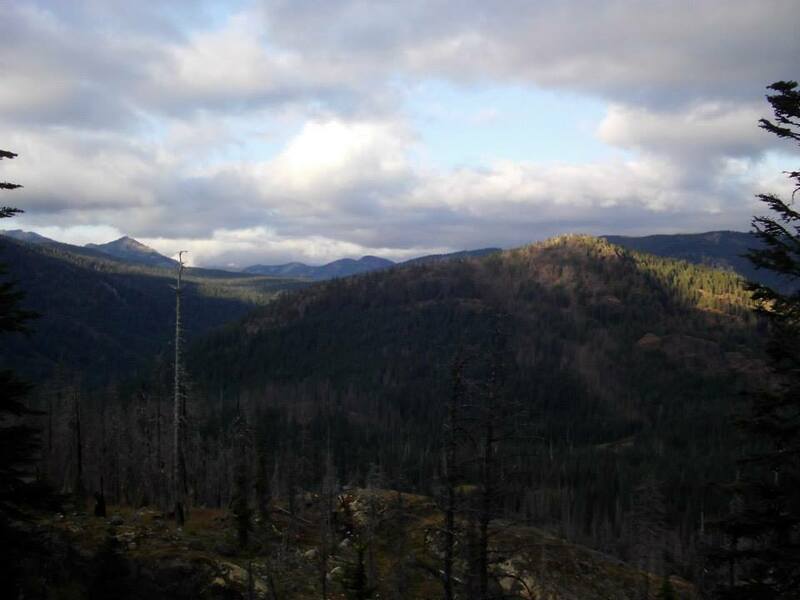 My last tasks were to head to the library to print out trail maps and then stop by the ranger station to get information on good water sources and to find out if there had been any reports of active predators on the trail. There hadn’t been any predator reports, so I was feeling pretty confident. A couple of days before it was time to head out on the trail, one of my friends thought it was important to share some of his overflowing scientific knowledge with me. “You know, bears are attracted to period blood,” He chuckled. First I laughed it off. There is a macho attitude around outdoor culture, and those kinds of jokes come up from time to time. I went about my day not really thinking about it, but then it popped up in my head again. What if he was right? What if they were like sharks? I’m sure if it was true there would be all sorts of articles about it right? Like real, real science? This set me off on a flurry of Google searches, and as anyone who has ever looked up their cold or weird rash on Web MD knows, the internet rarely calms anyone’s fears about anything. I found a report about two women who had been killed by a grizzly bear in Glacier National Park in 1967. It seems that’s where this whole thing started. One of the women had been on her period and one of the rangers had suggested that it may have been a factor in attracting the bear. There were a couple less memorable stories of encounters, but none so gruesome as the first. After the women were killed, some groups decided to test the theory. They found that black bears really didn’t care and that Polar Bears, being Polar Bears, were attracted to blood. However, I could not find one single study where they had tried to find out if grizzly bears were actually attracted to period blood. Mind you, it was a grizzly bear that had attacked and killed the woman on her period, which had kicked off the studies in the first place. There aren’t many grizzly bears in the Cascades. Occasionally one might make its way down from Canada or up from California, but it is rare. Unfortunately, there was no way of convincing the little voice called anxiety in the back of my brain of anything logic related, and so a little bit of doubt planted a seed of fear there. 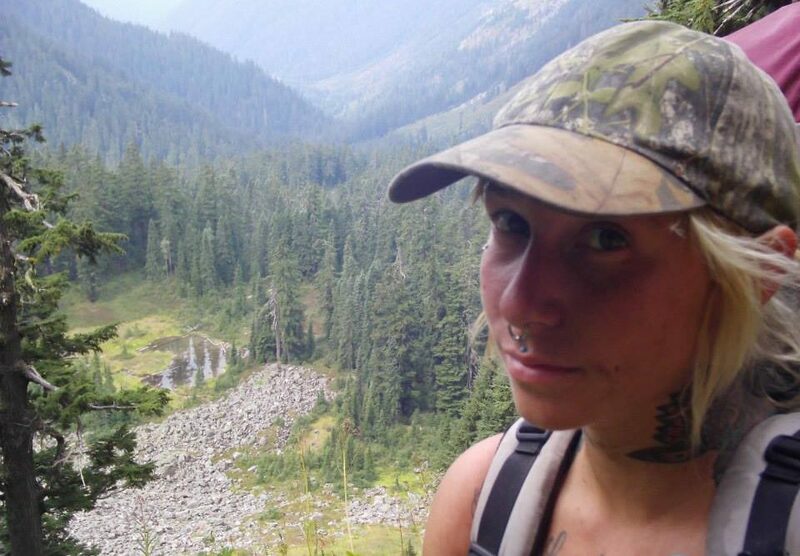 Despite my anxiety, the morning of August 10, 2015, my friends drove me up to Steven’s Pass and I started out on my journey, bear mace close at hand. From the Stevens Pass ski area, I started out with an immediate upward trek. Within minutes I knew that I had packed too much, but it was too late, there was nothing I could do about it until I reached Snoqualmie pass in a week. I daydreamed about being able to just ride the ski lifts up. I had no clue how you’d get a dog on one, but I knew if I had the chance I would damn sure figure it out. When I reached the top, like with any hike, it was all worth it. You could see mountaintops for miles in either direction. The valleys were smoke-filled from the neighboring wildfires which only added to the beauty and mystery of the distant mountains. Bubba and I made our way down the backside of the mountains and away from civilization into the wilderness. For the first little while, there were day hikers and the trail runs through massive electrical towers. Then the trail turned away and up the next hillside. Lake Joseph is at the top of that hill, and that is where the day hikers fell away. About five miles or so further into the hike is where I really began to feel the wildness of the place. The plan was to hike ten miles a day. Some days a little more or a little less, depending on the distance between the established campsites. Ten miles a day was a nice moderate pace that would still allow me to have frequent rest breaks and enjoy my camp surroundings at the end of the day. 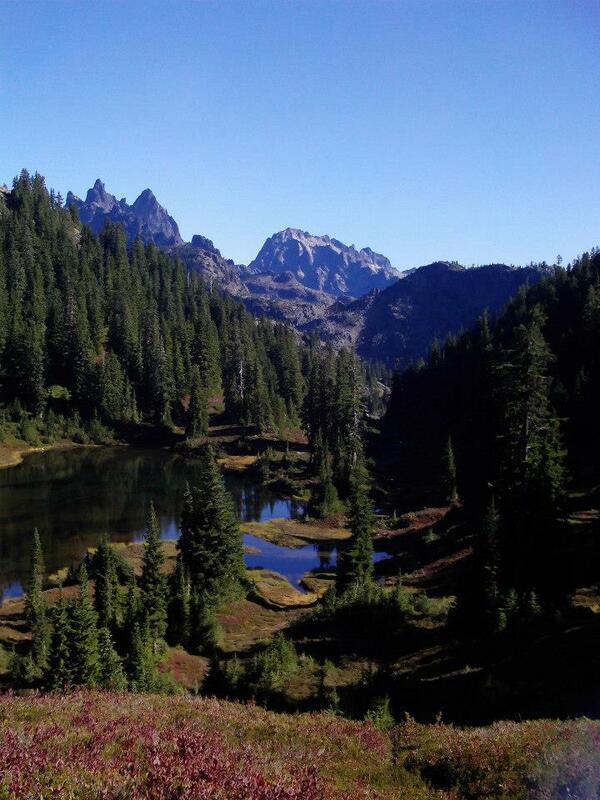 That gave me seven days to complete that section of the trail and then contact my aunt from Snoqualmie. I had told her to call the Forest Service only after ten days if she hadn’t heard from me, just in case it took me longer than was planned. I made my first campsite in a luscious, green clearing nuzzled in the armpit of where a steep wall of grey rocks and boulders met a sheer, granite face. The trail I had come in on was hidden by the tree line, and I felt more like I was encapsulated in a painting than in an open wild landscape. After eating a cliff bar and filling up my water in the stream, I surveyed my gear. I quickly realized that the can of bear mace had fallen out somewhere along the wooded trail. It was dusk and already dark within the trees. Since I hadn’t noticed, it could be miles back. It was futile to search for it. Instead, I found a tree to throw my food bag into and anchored the paracord in another tree nearby. Bubba and I settled in for our first night on the trail. Sleep did not come quickly as I took in the sounds of the wilderness around us, but it came. The second day was easier. Rising with the light, I packed up swiftly and we set out. Just around the corner, by the next water source, there were two sleepy hikers rousing from their tents. I gave a small wave, feeling silly for feeling so alone the night before. Though in the shroud of darkness, you never know what’s just past the next ridge. Much of my second day was spent ascending up a somewhat narrow trail way with steep switchbacks along a mountainside. This trail was made to go to the top and over. There was no easy way around so I rested a lot taking in the views. Another solo hiker showed me how to adjust my pack so it sat higher on my shoulders and closer to my back as well as how to use the hip straps to take some of the weight off my shoulders. She informed me that this was a pretty hefty trail to take on as one’s first solo hike, but that its beauty was more than worth it and that I would be better for it in the end. We wished each other a good hike and continued on our ways. Once we reached the top, it was thankfully all downhill from there. The grey rock and hearty, high-altitude plants gave way to moist, red soil, and the smell of smoke to the welcoming scent of timber. Before I knew it, my ten miles for the day were over and it was only three or four in the afternoon—though it was hard to tell. The smoke gave the mountains a timeless feel. In the red glow of the sky, there was no difference to the eye between nine in the morning or five in the afternoon. I felt this even more so after my phone died on the second night. That’s when I realized I had brought no other way to tell time, and the sun would be of no help on this journey. Two old section hikers joined my camp that night, and we enjoyed small talk while we made our dinners. 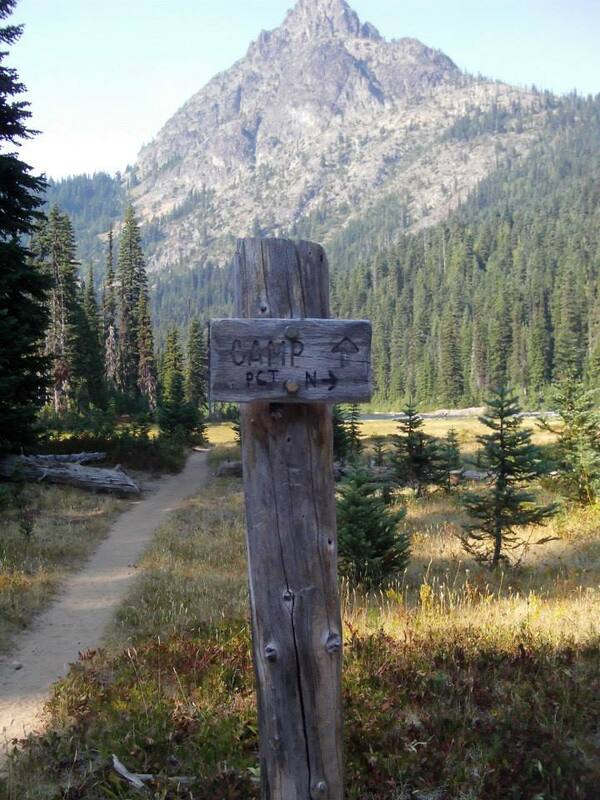 There are several types of hikers on the PCT: day hikers, section hikers, and through hikers. Section hikers do small chunks of the trail like I was doing. Often they do a couple sections every summer. Through hikers attempt the entirety of the Pacific Crest Trail, usually starting on the border of Mexico and heading to Canada. The hikers who had joined me informed me that they had both done the entirety of the trail twice, but they were only section hikers now. When I woke on the third day I thought I had slept in, but there was no way to tell. I packed my gear and set out. My maps told me that most of where I would be traveling that day had no water. At the end of this forested area, there was a huge river and waterfall area that split the trail. It was dangerous and slippery and you had to take a lot of care crossing it. Because of this, there were a lot of people bunched into this section either scouting it or slowly making their way across. At least if I got hurt crossing here, there would be people nearby to help or get help. Bubba and I made it across pretty easily, however, there weren’t any great places to fill up water. I got what I could, but I also didn’t have much in the way of water containers; only a Nalgene and a Camel bladder in my pack. Up until now, I had been mostly reliant on Bubba being able to drink directly from the small streams and ponds along the trail. It also turned out that I had no idea what it meant to climb four thousand feet in elevation in four miles. I can tell you now that I won’t do it unprepared again. The trail quickly became steep with sharper cutbacks than I was used to. I felt slow and lumbering, and was constantly passed by the other hikers on the trail going in either direction. The day before, I had taken to wearing my Chaco sandals instead of my cheap hiking boots which jammed my toes into the top of the boot when I walked downhill. While I trusted my footing far more in the Chacos, they left my feet unprotected. I felt every ounce of excess weight in my pack. And with every step closer to the top, it got hotter. It felt like the mountain was mocking my poor preparations, daring me to return to the safety of the river and start over. Eventually, the trees opened up to what looked like a desert-like mountaintop with amazing rock formations. I thought I had finally made it to our destination. I threw my pack down under a small, sad looking tree, with just enough shade for Bubba and myself. We shared the last gulp of water from the Nalgene and lay there panting in the meager shade. We must have looked something pitiful because when a northbound hiker carrying two gallons of water made his way up the trail past us, he stopped to chek in. He offered me some water and I almost turned him down, but trying to survive in the wilderness is no time to be proud. With a little shame, I accepted his offer and as I drank he informed me that this was most certainly not the top and it was still quite a ways to the next water source. Then he continued on down the trail, looking very experienced, in a way I knew I definitely did not. I was over it, I was just going to lay on this “not” mountaintop until I shriveled up into a sad prune. If I hadn’t had my dog with me, I just might have, but it wasn’t fair to him. He didn’t ask to come on this stupid trip. He just dutifully followed me wherever I went, never pointing out how dumb the decision I made might be. So begrudgingly, I pushed myself up and we continued. Heading down the other side was painful because I could see the lake. It was so blue and peaceful— and most importantly—wet. My mouth felt like sandpaper as I made my way down the switchbacks. The lake was much further away than I had realized upon first seeing it. I considering bushwhacking my way down to the bottom—screw the trail! But, I thought better of it, and kept an eye out for any water I could possibly find. About midway down I found a trickle of water in an alcove of rocks to the right of the trail. I pulled my Lifestraw off the hose to my water bladder, jumped into the rock outcropping, and thrust my straw into the water hoping desperately that no hikers passed in time to catch this sad scene. Then I held Bubba up to get a little water as well. In no way was there enough water to satisfy our thirsts, but it was enough to keep us going a little further. I think I cried on the way down that mountain. Years before I had almost lost Bubba to heat stroke while hitchhiking through Louisiana in August. I had to climb over a barbed wire fence into a cow pasture to throw him into a pond to save him. As I watched his eyes started to glaze over from the heat and dehydration, I was scared it would happen again. All we could do was take our time and make our way to the lake. To be honest, even if it had been judgmental, I was far too tired and content in the cool water to care. That spot made for my favorite campsite. It was a majestic mountain valley, with Deep Lake taking center stage. After setting up my tent we explored some. We found a waterway releasing from Deep Lake that was about a foot deep with tall tubular water grasses growing out of it. We spent much of our time running around and exploring like little kids in a tide pool. 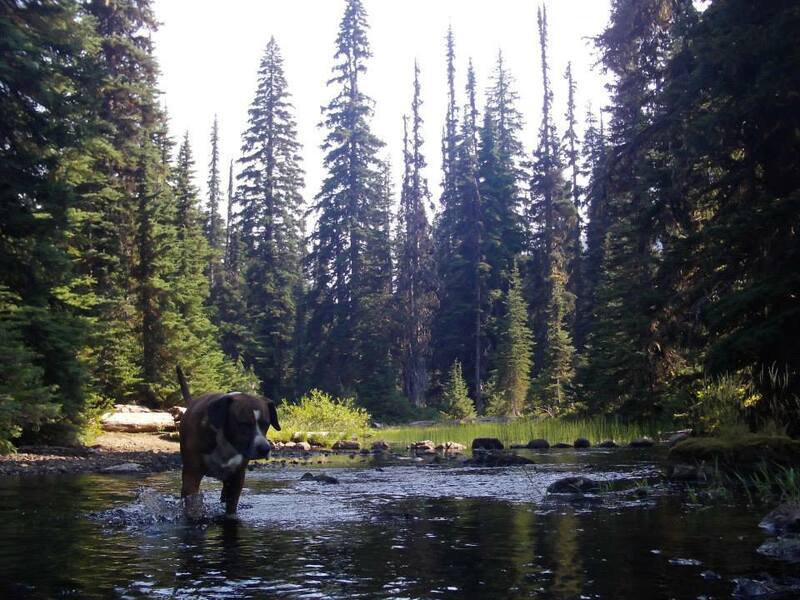 I could tell the Bubba was feeling much better and enjoying to cool, calm water. Or maybe I was just projecting. 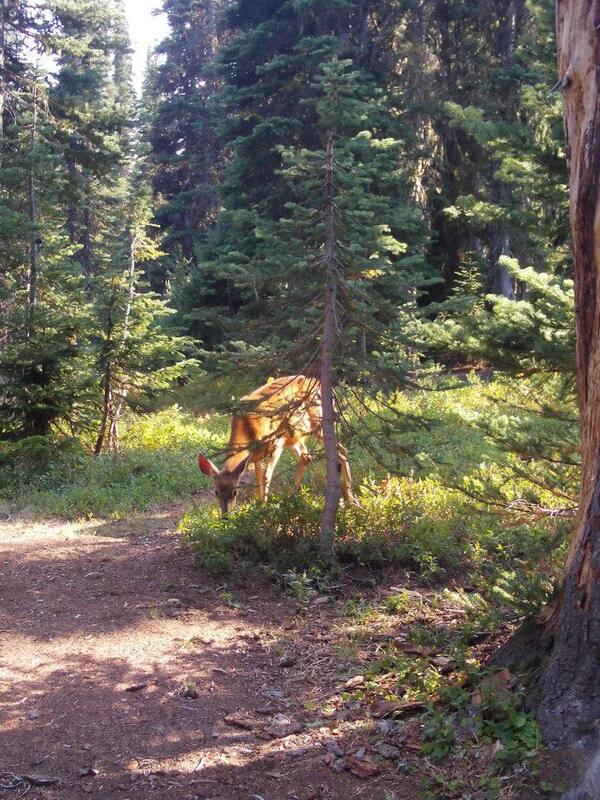 That night a deer came into our camp and hung out for a while, paying my dog no mind. I felt completely at home, and I was happy to find that I was no longer overwhelmed by being on the trail alone. This sensation was, unfortunately, soon shattered. I awoke in the middle of the night to find that I had started my period. All sense of safety vanished. The next portion of the hike should have been taken slowly and enjoyed. It was a five-mile section through a tree-filled valley that runs between two mountaintops. With beautiful ponds and creeks along the way and plenty of spots to relax under a tree, it should have been rejuvenating. It should have been. But thanks to the reawakening of my bear anxieties, it was far from it. I marched through that valley with a purpose. In my anxiety-controlled mind, if there was going to be bears on the trail, this is where they would be. My stops to get water or use the “facili-trees” were brief. I really only remember appreciating the beauty that surrounded me a couple of times. There were few hikers through this section, or so it seemed to me, and I became panicked when I felt that it had been too long between seeing other people. I remember asking almost everyone I passed for the time, just to have a little human connection to quell some of my nervousness. In retrospect, this seems ridiculous, but at the time it seemed like the most important thing in the world. At a quick and determined pace, I achieved my goal of reaching the other end of the valley and found myself climbing a much less inviting rocky hillside. As I made my way upward, the anxiety fog that had control of my fine reasoning skills began to dissipate. I realized that I might have made a dumb mistake in my haste. The next campsites were almost two miles up the trail and the temperature was beginning to drop. There was a moist wind that was bringing clouds with it. Had I calmly thought things through, I would have chosen to camp down below the tree line to have some cover from what I could now see was the impending rainstorm moving towards me. It was hard to tell how far the actual top was and if I could reach any cover on the other side before dark. I had come too far to to go back down the other way. I may have also been a little ashamed of my behavior and was unwilling to yield to the reminder, even if it meant having no cover from the rain. I set up my tent and prepared to weather what I hoped would be a light rainfall. Shortly after the rain began, I learned that it indeed would not be a light rainfall. I also learned that when buying a tent, you should probably spend more than a hundred dollars. The price difference determines whether or not your tent has sealed stitching and seams. My seventy-five dollar Alps Mountaineering tent most definitely did not. The stitching that held the tent together soaked up the waterfall of precipitation running down the side of my rainfly and spit it out inside. This made the bathtub of the tent (what they call the floor section of the tent fabric) exactly that. 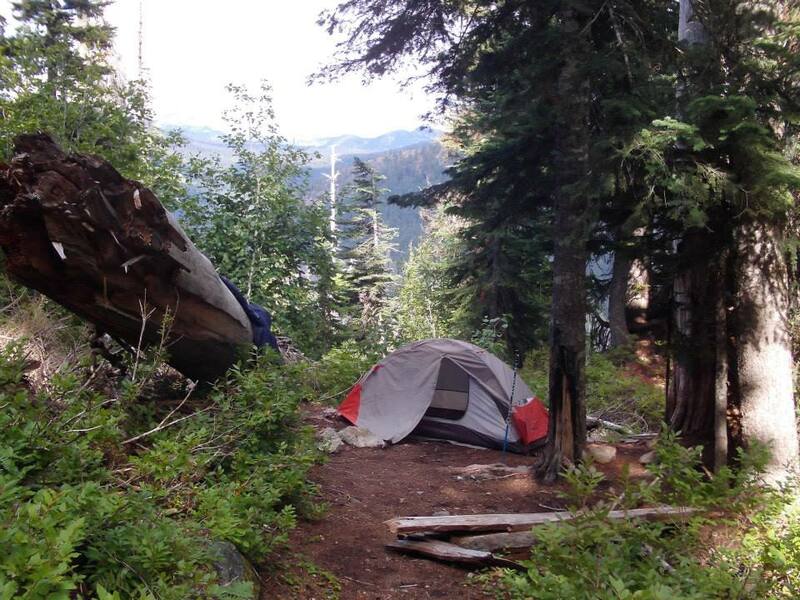 This experience also taught me an important lesson in staking down one’s tent. The soil where I had chosen to set up my tent that night was sandy and full of rocks, making hard to get the stakes to stay in place. Unfortunately, this allowed my rainfly to move around just enough to let a little water in through the netted windows. By this point, any amount of water was a bad amount of water. If there was any time during this week-long journey that my dog was obviously irritated with me; it was now. Bubba let out many audible sighs throughout the night. He gave me annoyed glances over his shoulder with one eyebrow raised before shifting around a half turn and sighing again as he snuggled his face into his belly. We battled for real estate in my small synthetic sleeping bag. He would do a few spins, pushing me out one side and I would wake up to the cold and shove him back out the other. The night was long and filled with strange half asleep half awake dreams that made it hard to tell where reality ended and the dream world began. There have been several times in my life where the sight of the sun on the morning’s horizon has nearly brought me to tears of gratefulness. This was, no doubt, one of them. The next day had a very surreal feel to it due to the sleep deprivation from the night before. The rain had stopped and a mist settled into the inviting spaces between the mountains. The grey seemed continuous, from the clouds to the mist in the valleys to the grey of the rocky mountain where I stood. I heard swishing sounds as I watched a hiker in rain gear make her way down the mountain the way I had come. I would be lying if I said I didn’t feel a little pang of jealousy at her forethought and preparation. I was soaked. My dog was soaked. The only thing that wasn’t wet was my food, which hanging from a tree in a dry bag. 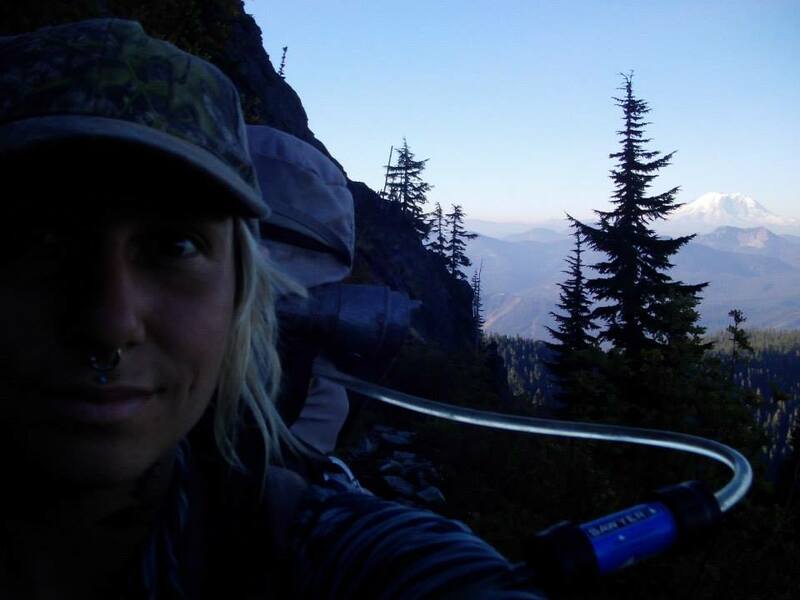 I was four nights into my hike and there were three until Snoqualmie pass, there was really no question, the only option was to keep on going and complete the section. The grey permeated the day. It didn’t take long to reach the top. All rock and sandy soil, the couple of lakes I came upon had a prehistoric feel to them. I filled my water and spent some time appreciating the algae before continuing on. As I hiked over the top of the mountain, I took in a scene that had filled me with awe. Amidst the grey were sparks of violet. A fire had been in the area a year or two before. There were burnt out trees all along the hillside, some were downed but many were still standing. They were ghosts of the forest that had once stood here. Between the trees, lush green plants had grown with the help of the ash from trees that once called the hillside home. Bright violet and lavender flowers grew out of some, and came up to my hip. They stood in stark contrast to their eerie backdrop. Picking my way through the trail, over and under fallen trees, I came to a massive standing burnt out tree. At the bottom there was an opening like a chimney. It was big enough for me to stand in and look up through the hollow center at the cloudy sky above. This place felt magical. I took my time here, absorbing it into my memory before reluctantly continuing on. The day went quickly. Bubba and I were both tired. Eventually, we made it to a bridge over a waterfall and found a campsite nearby. There was a huge fallen tree that was as big around as I am tall. It seemed like as good a place as any to lay my wet gear out to dry in the sun. Once everything was laid out and my tent was set up, we went to enjoy the waterfall for awhile while. After eating a dinner that consisted solely of a cliff bar, I found a tree on the other side of the trail to throw my food bag in and went to sleep long before sundown. So, some extremely brave mice had stolen my sock to make a nest. When I jumped back over the tree, I saw that they had also attempted to eat my leather belt. There were little gnawing teeth marks down a three-inch length. They had certainly taken there time. To my dismay, it turned out they were also in the trees and had climbed up and chewed a hole through my food bag. There was trail mix raining down as I slowly dropped my bag from the tree. They had not eaten too much of my food, but the hole was cause for concern. I chose not to dwell on it, we had one night left on the trail, and because I hadn’t brought any duck tape there was really nothing that could be done about it. The day was easy, although Bubba was obviously tired. Whenever we stepped off the trail to let other hikers pass, I would look back to find him asleep. 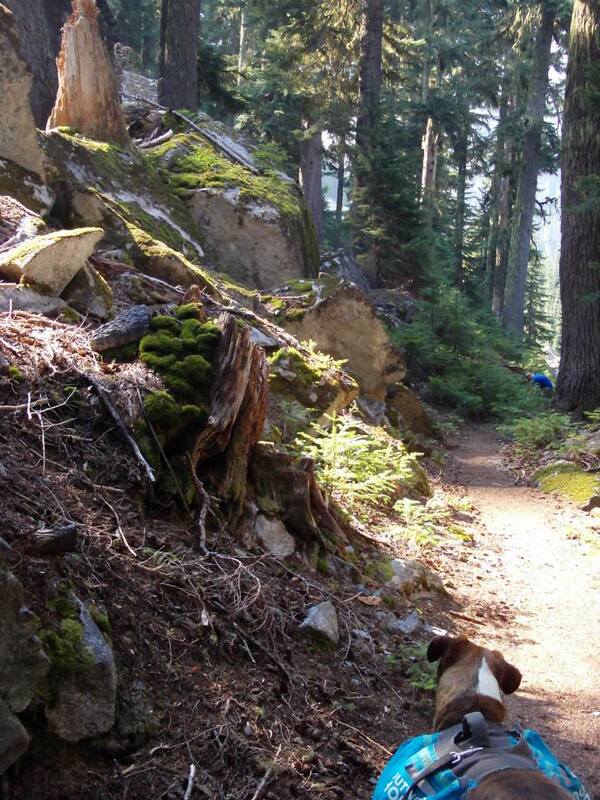 It was hard to get him the amount of calories necessary to keep his energy up on the trail. He was also just not the young pup he once was, but I appreciated him more than anything in the world. Without his love and companionship, this crazy journey would not be possible. My last night on the trail was bittersweet. I made my camp at Ridge Lake, with the door of the tent facing back the way I had come. It was a magnificent open view of the mountains that had taught me so much in so little time. While I sat there appreciating the view, I took stock of my physical condition. My feet were torn apart from hiking in sandals and every muscle in my body ached. The smoke had given way to a clear blue sky and this was the only night on the trail that I stayed awake long enough to watch the sunset over the mountains. On the seventh day, we made our way across the Kendall Katwalk, a one hundred and fifty-yard long section of trail that was blasted out of the granite. The trail was thin. With a wall of granite to my right and a sheer drop to the left. It made me nervous. 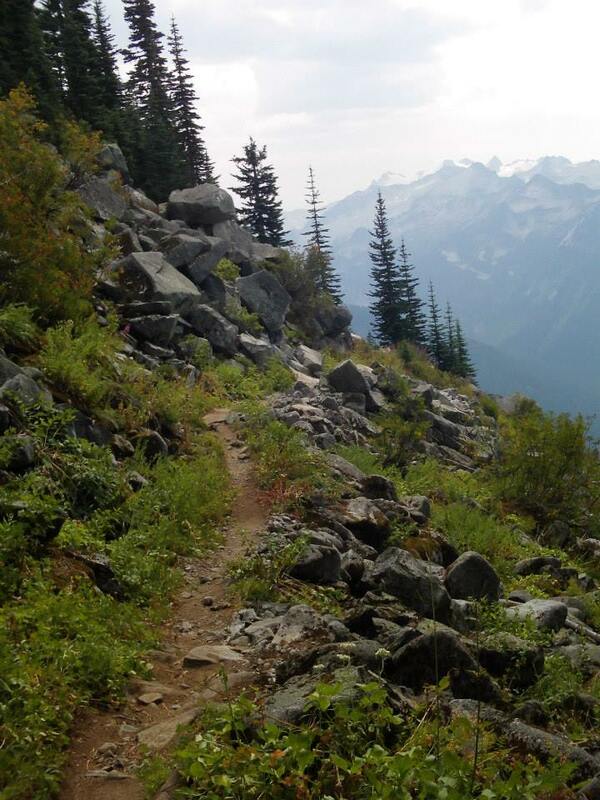 Tripping on a rock or poor footing on the trail could have dire consequences. 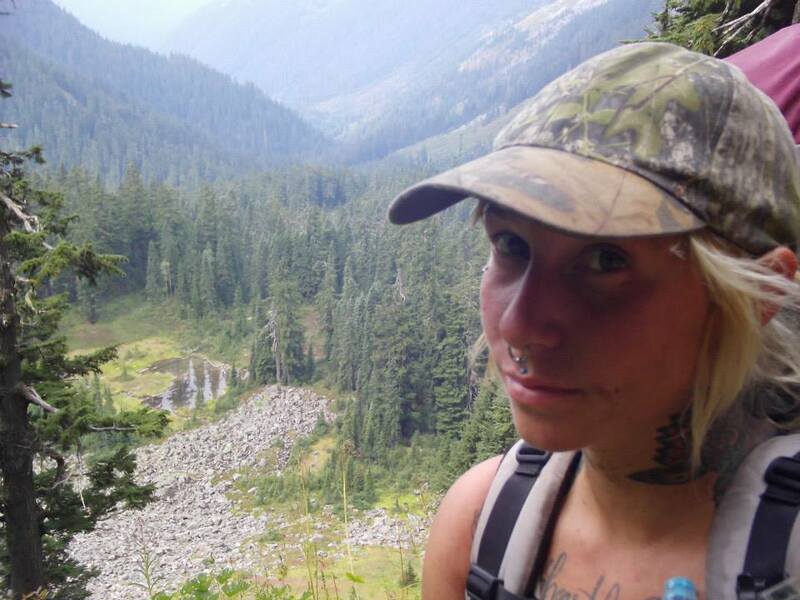 I remember hearing this past summer a woman fell off the trail to her death. Making it to the end of that section and into the treeline with the trail descending towards Snoqualmie pass was a relief. Looking up, I could see Mount Rainier in the distance, and down below traffic buzzed along I-90. Cars, clueless human beings, zoomed through the mountain corridor without a single thought to the strange people wandering the wilderness above. I had never been so happy to see an interstate before in my life and am not sure I ever will be again. We did not continue on to complete the next section; there would be time for that in the future. Now, it was time to rest.